As you all know, I love point 'n' click adventures; in fact, so far I've reviewed 26 point 'n' click adventures on this blog and that's not including games that are probably similar to point 'n' click adventures like The Walking Dead or visual novels. So when Fabrice Breton of Cowcat offered me a review copy of his latest point 'n' click adventure Demetrios - The BIG Cynical Adventure, it was an offer I couldn't refuse - especially considering I had it on my Steam wishlist :). What was interesting was the fact he wanted me to review it after reading my slightly negative review of Bolt Riley, a Kickstarter-funded point 'n' click adventure in Early Access. When I asked if he was sure he wanted someone like me to review his game, his response was that "it's still better to criticize something than not talking at all". The reason I mention this is that you can tell that Fabrice is a pretty choice bloke with his heart in the right place. So any criticisms in this review are not directed at Fabrice specifically but at the product itself and my relationship with it. So without further ado, let's move on to the review! I encountered very little bugs while playing the game, very little indeed. Occasionally there were issues with the save game overlays but they weren't showstopper bugs. The rest of the game runs very smoothly. While the game is technically a point 'n' click adventure, it's not like the ones made by Sierra or Lucasarts back in their heyday or even Broken Sword which the game is apparently a parody of. The game is played (mostly) from the first person perspective similar to classic ICOM games like Shadowgate or games by Legend Entertainment such as Frederik Pohl's Gateway or Companions of Xanth. The game also plays a bit like hidden object adventures too, especially when it comes to hunting for cookies on the screen (that are used for providing hints) and there are several other mini-games to play throughout the entirety of the adventure. Getting the difficulty just right in an adventure game is no easy task and I'm happy to say that Cowcat has managed to find a sweet spot with this one. There were a couple of times where I was stumped and I had to use the hints system but the solution was usually a pretty logical one or one that just required more persistence on my part. No King's Quest 1 style Rumpelstiltskin cipher puzzles here! Speaking of classic Sierra adventure games, Demetrios - The BIG Cynical Adventure has a myriad of ways to die - not only that but it celebrates it in a way too by awarding you achievements for each unique way of dying that you find. This is actually a feature I really like and am glad to see it resurface in the genre. This goes hand-in-hand with what I mentioned earlier, how Demetrios - The BIG Cynical Adventure manages to merge the point 'n' click and hidden object adventure genres. There is so much detail on each screen and lots of items you can interact with. Yes, I'm not sure why this is an option but it's an interesting feature nonetheless: you have the option of changing the character names to ones of your liking. 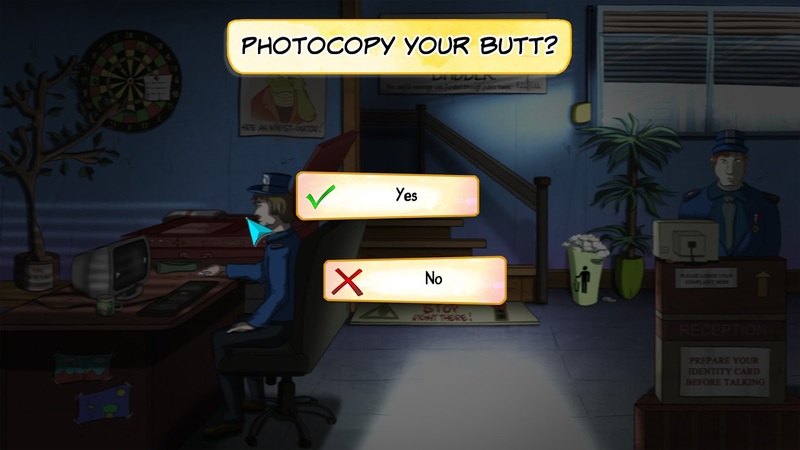 I enjoy some of the humour in the game especially the fact that the characters break the fourth wall and the frequent references to classic point 'n' click adventures, but that's about it. I find a lot of the humour in the game to be juvenile, toilet humour, which could appeal to a certain demographic (even a very large demographic considering how popular South Park is) but I really struggle with it - so much so I find it to be a severe hindrance to what is a well executed game. There's a lot of fart jokes, urinating on plants, defecation on photocopiers, etc. It's just not my thing but it might be yours. Demetrios - The BIG Cynical Adventure is a well-polished, competent, first person point 'n' click adventure game. There's quite a lot to do, it's accessible and it does happen to pay tribute every so often to classic adventure games of yesteryear. However, I really couldn't stomach the humour and if you're not into toilet humour you might want to give this a miss. If you like things like South Park though, this could be worth a try. Is the game worth $9.99 USD? : Yes, provided you enjoy the humour. There's quite a bit of gameplay here for your money.